Hunter S. Thompson. ‘Hell’s Angels: The Strange and Terrible Saga of the Outlaw Motorcycle Gangs’. Hunter S. Thompson rode with the Hell’s Angels for a year and his book title gives a fairly clear indication of what went down. When he voiced his disgust over an Angel’s member beating up a woman, he was set upon by several Angels and given a vicious ‘stomping’. Motorbikes have always exercised a strange fascination. Part of their charisma is that folk such as: Marlon Brando, James Dean, Peter Fonda (Easy Rider movie) and the eternally cool Steve McQueen (above) had a thing for motorbikes. Today – with the exception of Pink, Cher and a few other women who ride motorbikes – the field is dominated by men. So we have Bear Grylls, Bradley Cooper, David Beckham and Ewan McGregor regularly photographed astride their macho/vintage motorbikes. Living bayside, I’m aware of the city’s night sounds. Sometimes there will be a solo bird winging home late and cackling to himself, a tram rumbling past on its last run, police choppers circling overhead, or cop car sirens waking everyone up as they scream down the road. Frequently in the midnight hours, there’s also the racket generated by a pack of bikies having their own private Grand Prix around the lake. Only the black swans know for sure who they are, but locals whisper that they come from a bikies clubhouse nearby. Of course there are many motorbike groups who are composed of sober citizens who simply like to ride. In my neighbourhood, the most visible group are the mature gentlemen who ride their motorbikes on a Saturday morning down the beach esplanade and then crowd out the French patisserie. With their pots of tea and warm croissants they’re in stark contrast to HST’s Hell’s Angels. For one thing, they have no truck with vintage bikes such as ear shattering Harleys or throbbing, heavy-duty Kawasakis. Instead their pleasure machines of choice are recent model, luxurious BMW motorbikes. I used to ride a motorbike until I was wiped out in a road accident when a doped-up driver failed to give way to me. I knew I’d used up all my cat’s nine lives in one go, so I didn’t replace my motorbike which had been pulverized. I was lucky because the force of the impact sent me over the car bonnet. Prior to owning a motorbike I used to ride pillion with a bunch of university chums who were partial to cumbersome old Kawasakis, Nortons, Triumphs and Harleys of the loud variety. Riding pillion for long distances was a tad cramped because I had to sit with my knees raised above the hot metal of the naked exhaust. So I learnt to stretch my legs at red lights by planting my legs on the road and standing up – while still hovering above the pillion seat. I got caught out one night when we were on our way to the trendy end of town for what my buddies called a ‘food fix’. So there I was doing my leg stretch when the red lights changed to green and the motorbike screeched off – leaving me behind, on the road in my bow-legged cowboy stance. I was laughing so hard that I nearly got run over by the cars behind. I knew my bikie chums were mortified. They had to cruise the entire street just to execute a U-turn and then come back and retrieve me – watched by sneering hipsters. The guys I rode with were kitted up in vintage metal headgear or sinister full-face helmets, black leather bikie jackets and black bovver boots. It was the boot of choice for skinheads, university Marxists, Chardonnay Socialists and those who were partial to a little argy-bargy. Often bovver boots were fitted with steel capped toes. It was comedic when I got invited to posh pool parties and discovered that many of these ‘born to be wild’ bikies were being bankrolled by their uber rich, conservative parents. 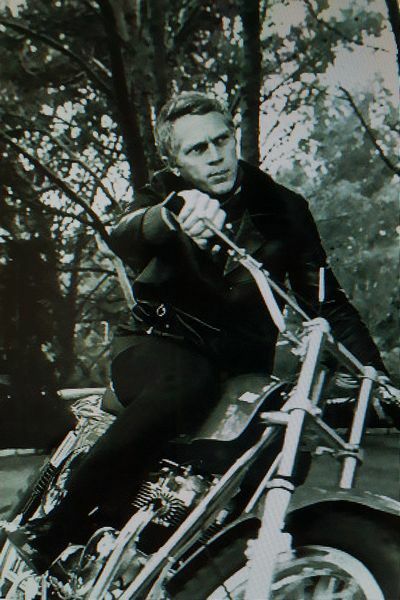 Photograph: Actor Steve McQueen rode and raced motorbikes. Vintage Indians, the Husqvarna 405 and Triumph TR6’s were among his favourites. Before his acting career took off, he worked as a mechanic in a NY motorbike repair shop.